Representatives from the United States and Cuba will meet in St. Petersburg today as they near agreement on a plan Caribbean nations would follow in dealing with future oil spills that span borders. The workshops have been conducted for three years and include Mexico, the Bahamas and Jamaica. Called the Multi-Lateral Technical Operating Procedure, the plan spells out responsibilities following a spill such as 2010's Deepwater Horizon disaster, including who will be contacted and how visas will be cleared for vessels and personnel. Among U.S. agencies attending the workshop will be the Coast Guard, the Department of State and the Department of the Interior. Until the plan is agreed upon, government agencies refuse to discuss specifics. They also refused to disclose the location of the gathering. "One of the things this group has done over our six meetings it try to keep it fairly low-key because they are only technical discussions," said Coast Guard Capt. John Slaughter, the service's representative at the planning meetings. "They are not political discussions or anything like that." Politics did play a role in the planning, though. Getting Cuba and the United States together proved a challenge because the trade and travel embargo imposed in 1960 barred discussion between the technical experts from each nation who would respond to an oil spill. For the United States to talk with Cuba, the meetings had to involve other countries and operate under the auspices of the United Nations and the Cartagena Convention, an agreement requiring nations in the Caribbean region to take necessary measures to protect and preserve rare and fragile ecosystems. The cleanup plan was deemed a necessary measure. "Knowing who to talk to and who needs to do what when dealing with disaster response is important," Slaughter said. Slaughter said he is confident the plan will be complete by the end of the year. He said that because it is a "nonbinding technical agreement," it does not require high-level approval and will go into effect as soon as the work group approves it. Recent oil exploration on Cuba's northern shore led by Spain's Repsol oil company came up dry. However, experts expect more exploration because of estimates that some 5 billion to 20 billion barrels of oil and 8 billion cubic feet of natural gas will be found beneath Cuban waters. A final plan will be the second step taken in recent years to protect the United States from spills outside its waters. In 2012, the Cuban Office of Foreign Assets Control issued the Coast Guard a license to enter Cuban waters with government approval in the event of an oil spill that could reach the United States. 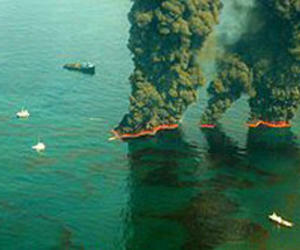 The Coast Guard also was licensed to bring in private companies that have the technology to contain a spill. The 2012 agreement recognizes that private companies have the best technology for the job, said Dan Whittle with the Environmental Defense Fund, a nonprofit environmental advocacy group. Whittle has been indirectly involved as a consultant in meetings on a clean-up plan. Because oil from a Cuban spill could reach Florida in less than a week, U.S. interests wanted more than case-by-case permission from Cuba. The concern was that red tape would prevent an immediate response, said Lee Hunt, president-emeritus of the International Association of Drilling Contractors. That's why the plan is being developed. The association has represented the oil and gas drilling industry since 1940 and trains engineers on oil rig safety procedures. Hunt has been involved in the workshops as a technical consultant and will attend Friday's meeting. The plan stands to benefit all the participating nations. "If there was an oil spill in the Bahamas a year ago," Slaughter said, "as a technical responder I would not have known who to reach a counterpart in that country." At least not fast enough to respond in time to be effective, he added. After the plan is approved, mock operations among members of the coalition will routinely be held to prepare for the worst. The Coast Guard will be involved, making it a military operation involving two nations with no diplomatic relations. U.S. Rep. Kathy Castor said the U.S. and Cuba militaries have worked together before to battle drugs and illegal immigration, drawing objections from Cuban-American interests who resist any thawing of relations with Cuba until the Castro regime is ousted. "We do a lot of that, and it goes unnoticed by a lot of the hard-liners when it comes to Cuba and U.S. policy," said Castor, a Democrat representing Tampa. If Cuba does strike oil, it could provide the nation with an economic boost -- and that has critics of the Castro regime raising objections to cooperation in cleanup efforts. They say sharing knowledge with Cuba on the oil industry is a bad idea. U.S. Rep. Ileana Ros-Lehtinen, a Cuba-born Miami Republican who opposes improved relations with Cuban leaders, said she is skeptical of their intentions in the cleanup talks. "The Cuban regime cares little for the health of the Cuban citizens and cares even less about protecting the environment," Ros-Lehtinen said in a statement to the Tribune. "The tyranny is always eager to sign any accord that makes it look good and then fails to comply with any word of the agreement. Thinking that the Castro brothers are negotiating in good faith is ludicrous." Whittle with the Environmental Defense Fund said he hopes to see politics kept to a minimum in the cleanup discussions. "They need to realize this is an environmental issue, not a Cuban issue," he said. Florida Sen. Marco Rubio seems to share that sentiment, though he, too, remains an outspoken critic of improved relations with Cuban leaders. The Cuban-American Miami Republican would not answer questions about the St. Petersburg meeting, but his staff referred to a speech he made in March 2012 when he talked about the cleanup agreement. "I think it will generate some revenue for them," Rubio said, "but it takes years to turn that into a profit. I'm more concerned about potential environmental aspects." Castor said she is convinced Cuba takes its environmental duty seriously. She visited the island nation while Cuba was seeking oil. "They may take it more seriously than members of the United States Congress," Castor said.